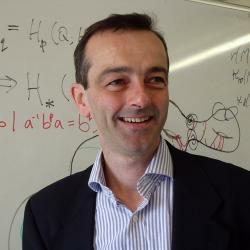 Xerrada de Martin Robert Bridson (professor a la Oxford University i president del Clay Mathematical Insitute). Títol: Hyperbolic geometry: where battered gems retain their full beauty. Resum: Hyperbolic geometry provides a rich setting in which many rigidity phenomena emerge. In this talk for a general mathematical audience, I shall present several different types of rigidity phenomena, from Mostow’s classical rigidity theorem to generalizations involving the large-scale geometry of groups and spaces. I shall end by sketching how a newly discovered rigidity phenomenon in hyperbolic geometry can be used to settle an old question concerning the difficulty of identifying an infinite group by studying its actions on finite objects.